in The Convention of Forty/ La Grande Convention by Pierre Parenteau, Norbert Laronce, and Jean-Baptiste Tourond. The precise electoral boundaries of the St. Norbert electoral riding are unknown. 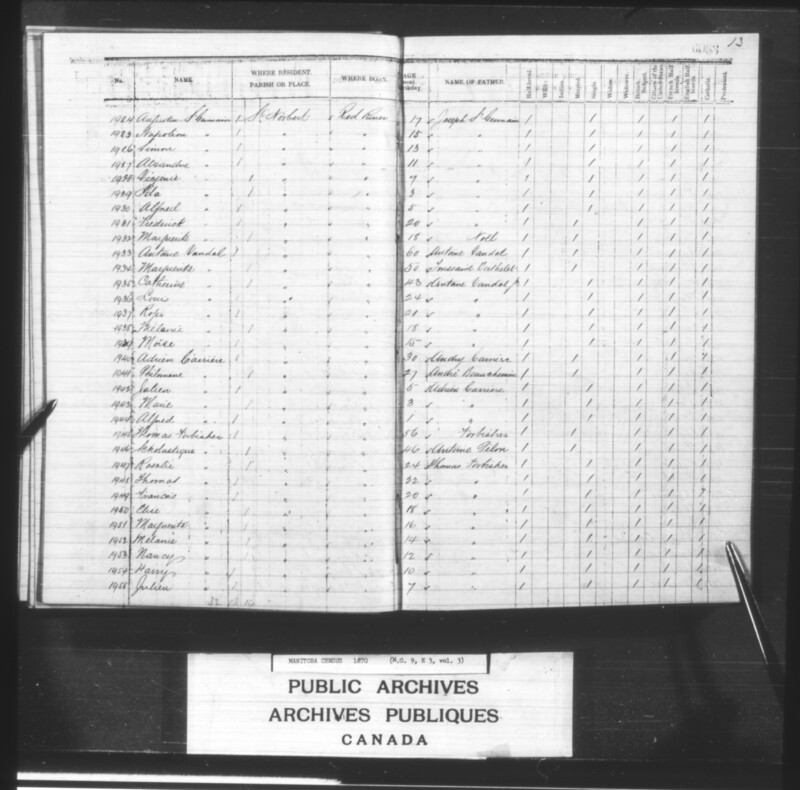 According to the Archibald census of October 1870, St. Norbert (north) began after the lot owned by Pierre Gladu of St. Vital. 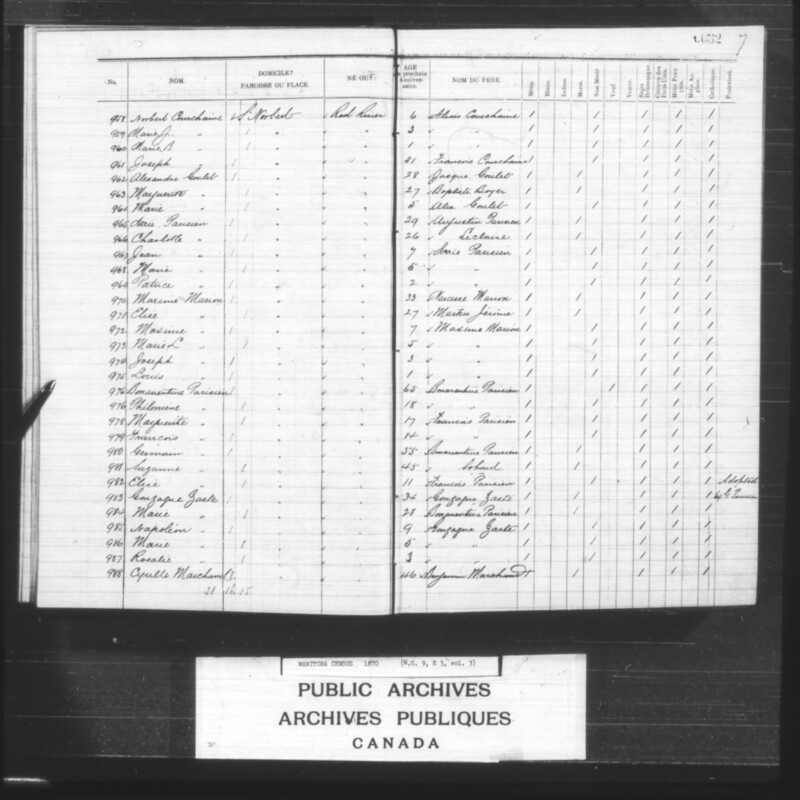 There is a notation in the census that indicates a boundary between St. Norbert (north) and St. Norbert (south), but Pointe Coupée was included within St. Norbert (south), which had not been the case earlier that year, during the elections for the Legislative Assembly of Assiniboia. The list below is a start to reconstructing the St. Norbert of the Resistance, using a map drawn by J.A.U. Beaudry in 1871 as a reference and operating on the assumption that the riding of St. Norbert (south) ended at about the lot owned by William Dease at Pointe Coupée. Rivière Sale, photographed at St. Norbert c.1900. By 1811, the Pembina Trail leading south from The Forks/ Coblenz along the west bank of the Red River to Fort Daer was well known and well used. 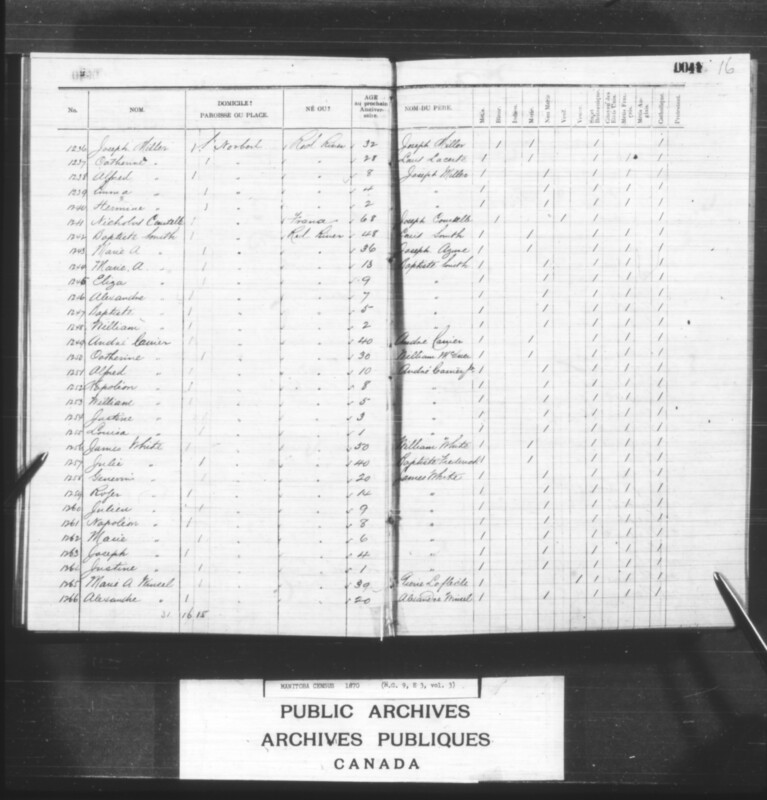 Former North West Company [NWC] carpenter, Jean-Baptiste Charette and his wife Charlotte Sansregret, built a “sturdy oak storey-and-a-half cabin” at Rivière Sale as a stopping house for travellers — the first commercial venture at the location [see photo]. 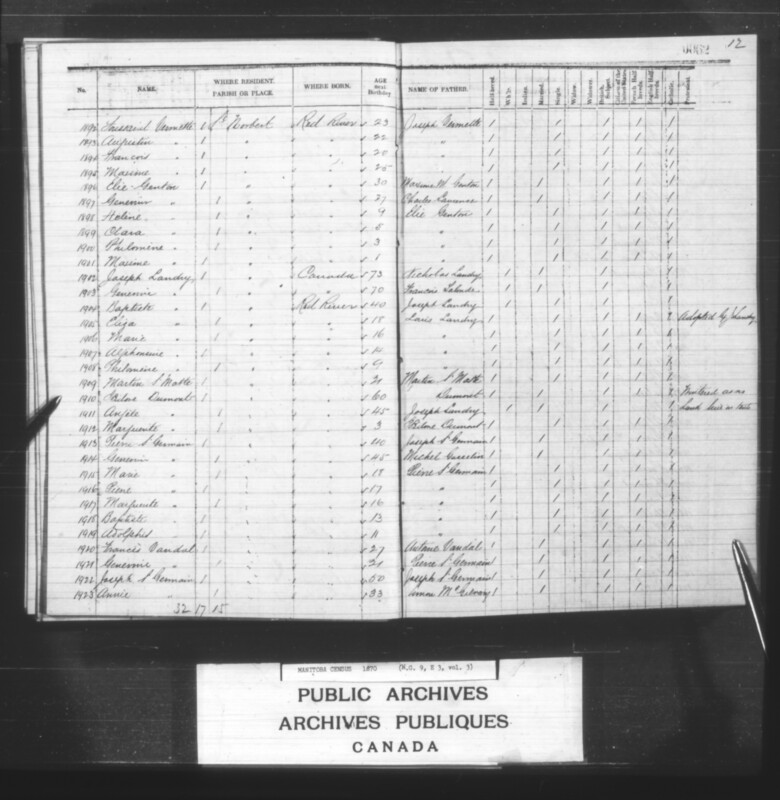 A few Métis families, engaged in the seasonal pursuits of freighting, farming, and the buffalo hunt, followed the Charette’s lead and settled nearby — and lent aid to under-supplied Selkirk Settlers in 1812. 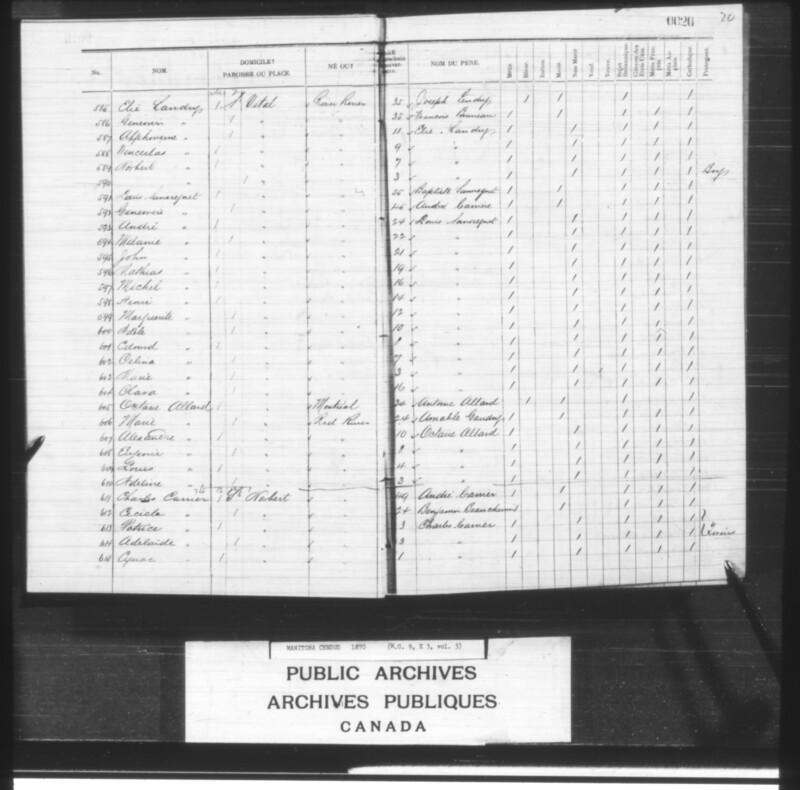 By 1822, additional families were relocating to Rivière Sale from Pembina (and elsewhere in territories where they had formerly worked for the NWC, which had amalgamated with the Hudson’s Bay Company [HBC] in 1821 and then laid off ‘redundant’ employees). Permanent dwellings, animal shelters, and cultivated properties became more common. 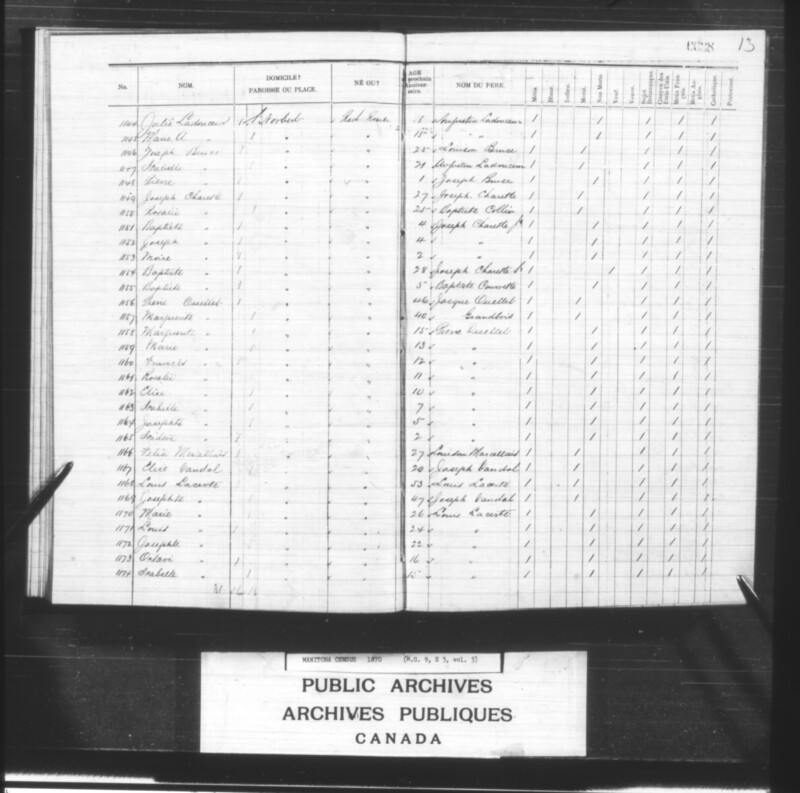 By 1844, the Catholic Church knew the settlement as mission de la rivière Sale/ the Sale River Mission. 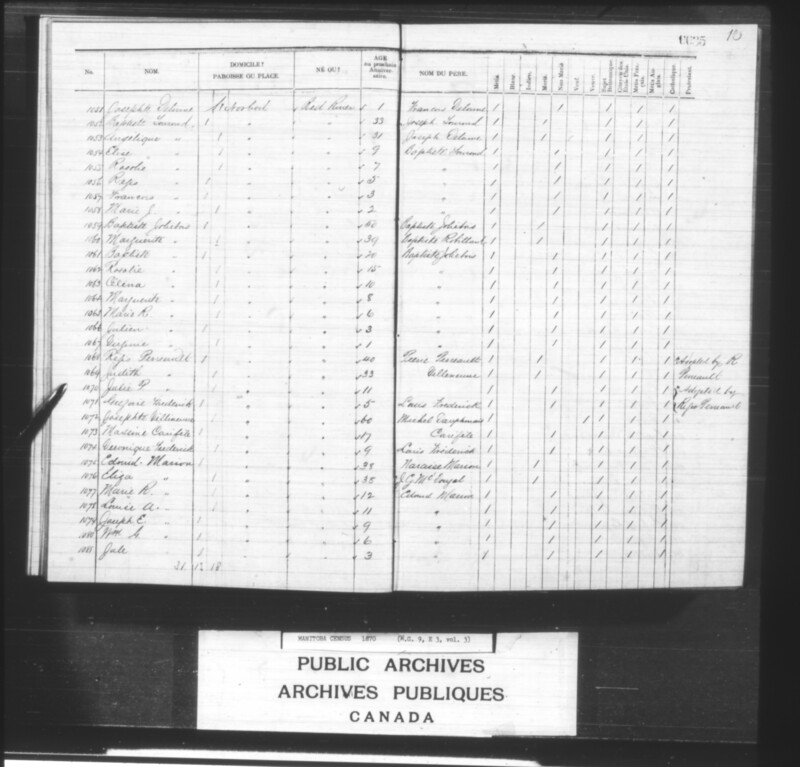 Sister Marie-Marguerite Eulalie Legrave of the Sisters of Charity/ Grey Nuns at St. Boniface was travelling to the settlement twice a week to hold catechism classes. In 1853, a new road — the King’s Road — was built on the west side of the Red River, connecting the Rivière Sale settlement (and properties as far south as Pointe Coupée) to the Hudson Bay Company’s Upper Fort Garry. Father Louis-François LaFlèche was assigned to build a church, located off the road, downstream from the mouth of the Sale. In 1855-1856, he constructed a wooden chapel that was 90 feet long and 30 feet broad, which also served as a residence for the first parish priest, Father Jean-Marie-Joseph Lestanc. The mission was elevated to parish status in 1857. Bishop Alexandre-Antonin Taché named the parish St. Norbert, after the patron saint of his predecessor Bishop Joseph-Norbert Provencher (who died 1853). St. Norbert was the third Catholic ecclesiastical parish founded at Red River Settlement, having been preceded by St. Boniface and St. Francois-Xavier. A boys’ school, run by two priests, was opened at St. Norbert in 1857 for about 30 pupils. The next year, two Grey Nuns, Sisters Hedwidge Dandurand and Flavie Laurent opened a convent and school for an equal number of girls. In 1860 Father Charles Mestre replaced Lestanc and established the first cemetery (incidentally, he disapproved of buffalo hunting as an occupation). Rev. Nöel-Joseph Ritchot replaced Mestre in 1862. 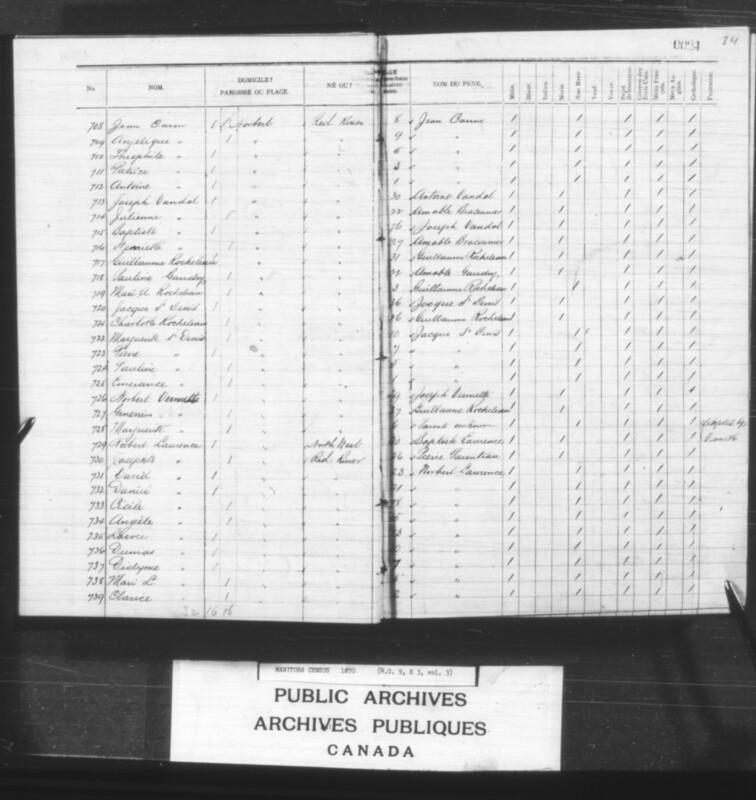 By 1868, a census indicated that of the 192 families with residences in St. Norbert Parish, 68 continued to work principally as hunters. The people of the parish were early responders to encroachments made by newly arrived Canadian land speculators in 1869. 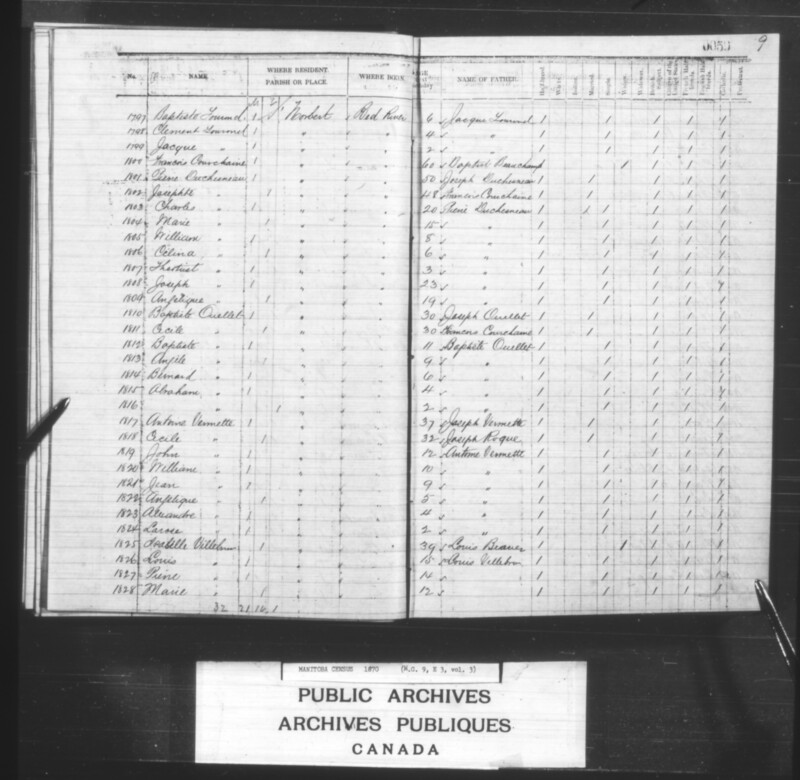 In July of that year a meeting was held at St. Norbert Church and the settlers created a system of mounted patrols to police the area and remove survey stakes placed by newcomers. 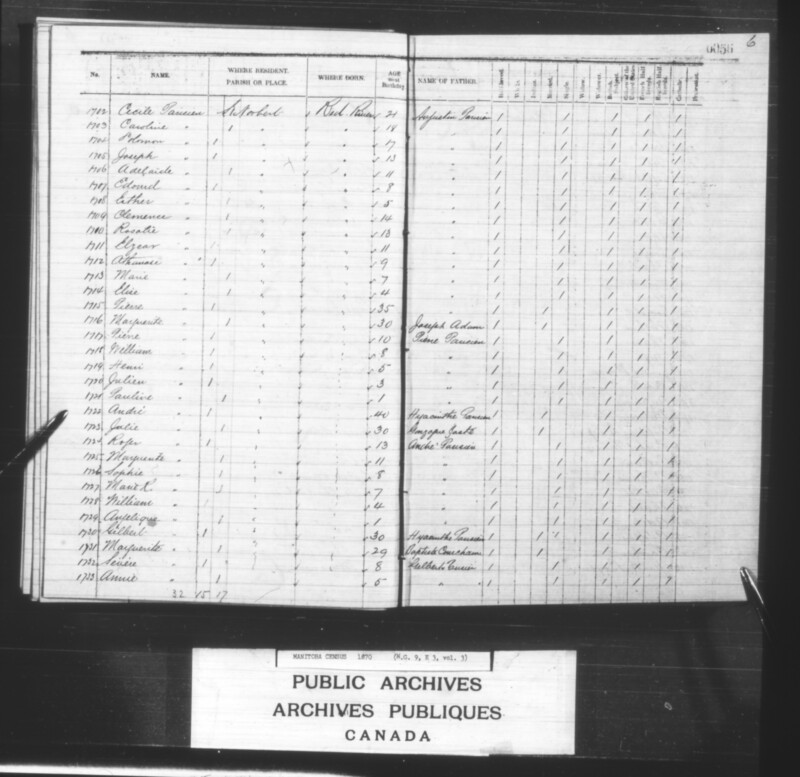 In October of 1869, le Comité Nationale des Métis de la Rivière Rouge formed at St. Norbert. 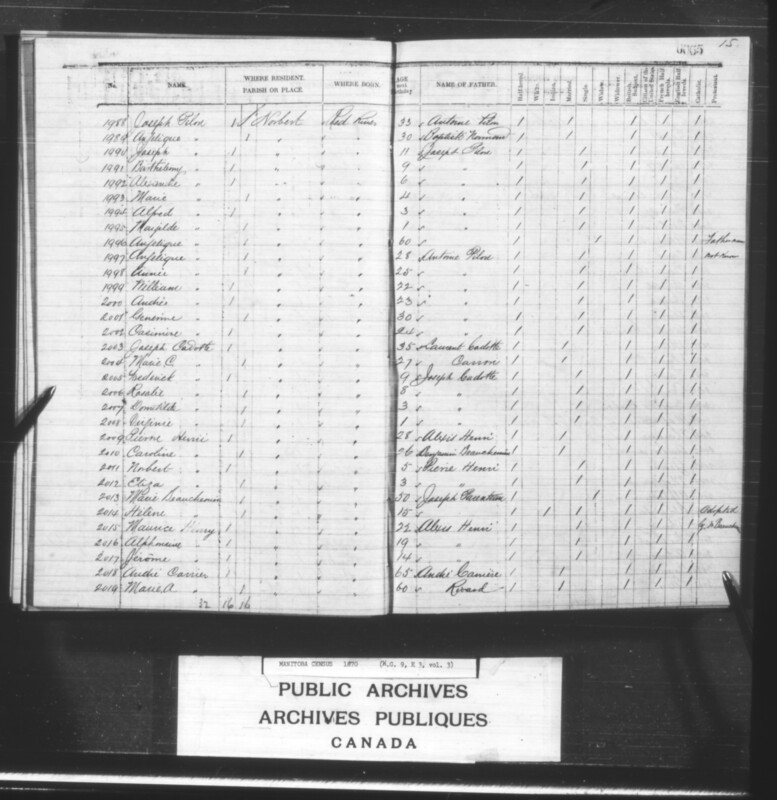 John Bruce (of St. Boniface) was elected as president and Louis Riel (of St. Vital) as secretary. Committee members (including Jean-Baptiste Tourond) had been made aware by press reports that the ‘foreign country’ of Canada had sent an intended Lieutenant Governor of Rupert’s Land, William McDougall, with men and 350 rifles to impose an unrepresentative Canadian government upon the people of Red River. The Comité determined that McDougall would not be allowed entrance to the territory until he agreed to recognize the right of Red River settlers to enjoy the same elective powers held by British subjects elsewhere, including Canadians (along with other rights Red River settlers wanted assurances on). Four men were sent to stop McDougall at Pembina. At the same time, 40 men, principally from St. Norbert and St. Vital parishes, formed a local militia — the Patriot Army/ Patriotes — to block the Pembina Trail with a wooden barricade, known as La Barrière, at the Sale River crossing (which was in a different location than it is at present). Rev. Ritchot was an active supporter of the Resistance. 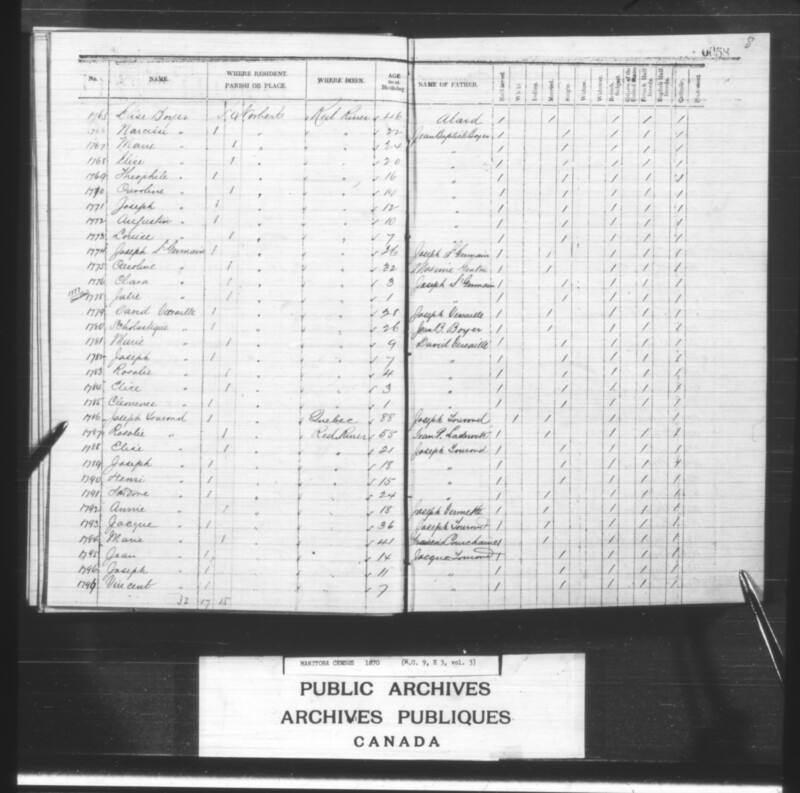 On 24 October, he negotiated an agreement with William Dease Sr. (of Pointe-Coupée) and his ‘Peace Party’ — which was in favour of allowing McDougall’s entry — to remain neutral. 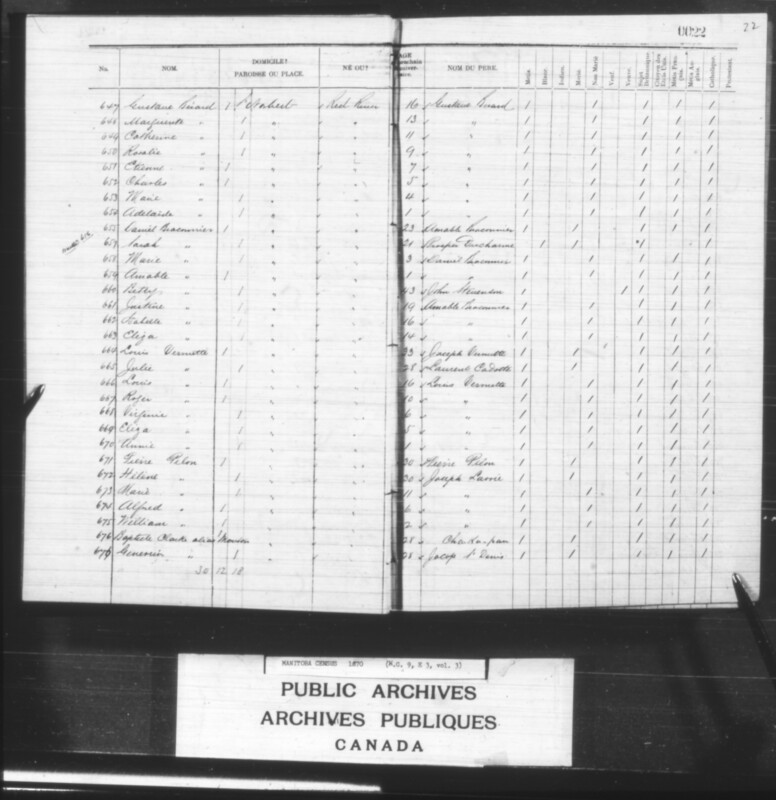 Some of Dease’s men joined the Patriotes, increasing the number of men at La Barriere to 100. Apparently, however, Dease continued to raise objections. As an appointed member of the proprietary government of the HBC, Dease was critical of the idea of instituting a provisional government in its stead (or at least of instituting one that did not pursue his particular agenda [See Possible Objectors to a Provisional Government, 29 Nov. 1869, this site]). On 10 February 1870, Ritchot was chosen by elected members of the The Convention of Forty/ La Grande Convention as one of three delegates, who would travel to Ottawa and present the terms by which the settlers at Red River (numbering about 12,000, with about 1,055 living at St. Norbert), would agree to confederation with Canada. At age 16, Flavie entered the order of the Sisters of Charity. She arrived at Red River in 1850. Mary’s family was from Clinton County, NY (after arriving from Tipperary, Ireland in the 1820s). Many of Mary’s relatives relocated to Nashua, New Hampshire, but other relatives stayed at Medina and Holley, Orleans County and Ogdensburg, St. Lawrence County, NY. 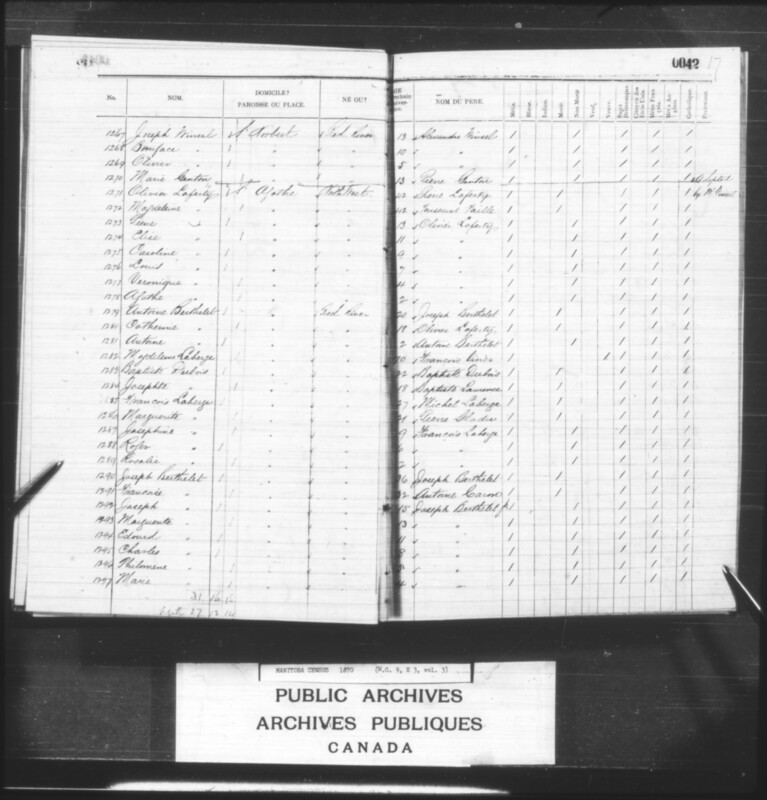 By one account, at 18 years of age Mary visited Montreal. Presumably, having been inspired by the Grey Nuns’ accomplishments at New York, and further impressed at Montreal, she chose to join the order. She arrived at Red River in c. 1864. – [307-309] Joseph 13, Elise 4, Appoline 1. 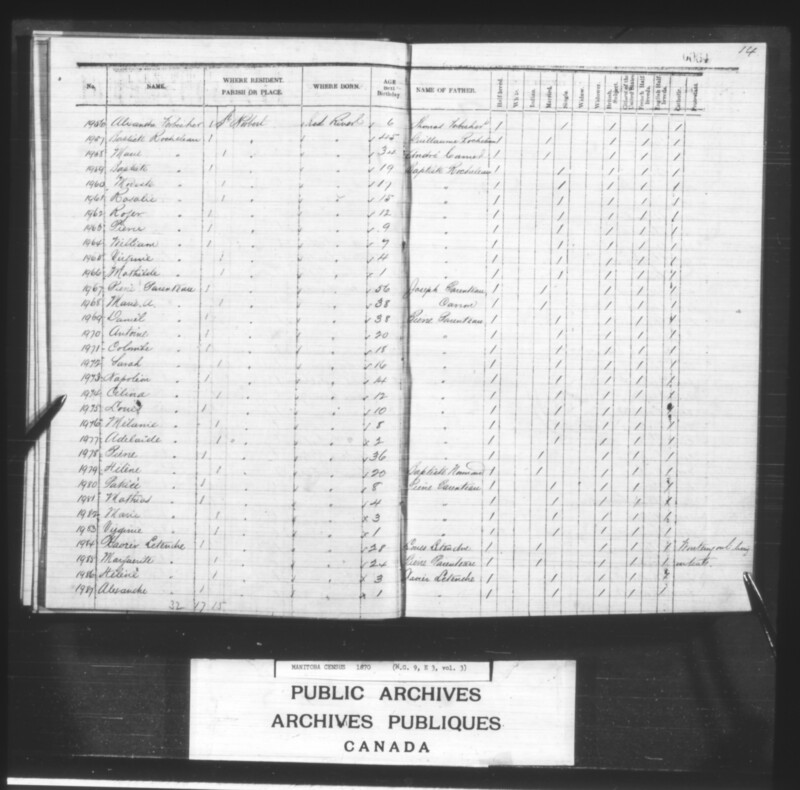 – [1054-1058] Elise 9, Rosalie 7, Regis 5, Francois 3, Marie J. 2. – [722-725] Marguerite 10, Pierre 7, Pauline 5, Emerance 1. – [708-712] Angelique 9, Jean 8, Theophile 5, Patrice 3, Antoine 1. – [701-702] Felix 23, Eliza 19. – [693-698] Baptiste 12, Joseph 9, Sarah 7, Philomene 5, Patrice 3, Elzear 1. – [688-690] Alexandre 4, Joseph 3, Virginie 1. – [684-685] Alexandre 15, Isabelle 3. See genealogy; genealogy; genealogy — possibly I have confused the identities of two or more women/ couples/ families here? – [677-679] Eliza 10, Roger 6, Annie 3. – [666-670] Louis 16, Roger 10, Virginie 6, Eliza 5, Annie 1. – [661-663] Justine 19, Isabelle 16, Eliza 14. – [658-659] Marie 3, Amable 1. – [639-641] Marie 4, Josephte 3, Philippe 1. – [631-636] Joseph 13, Rosalie 11, William 10, Annie 8, Modeste 6, Norbert 2. – [647-654] Gustave 16, Marguerite 13, Catherine 11, Rosalie 9, Etienne 7, Charles 5, Marie 4, Adelaide 1. – [618-625] Pierre 23, Antoine 20, Isabelle 19, Josephte 14, Melanie 12, Marie 10, Jean 8, Philomene 3. – [613-615] Patrice 3, Adelaide 3, Cyriae 1. – [2020-2024] Daniel 25/ 27, Louis 22/ 23, Leocadie 20, Cecile 18, Leon 16. 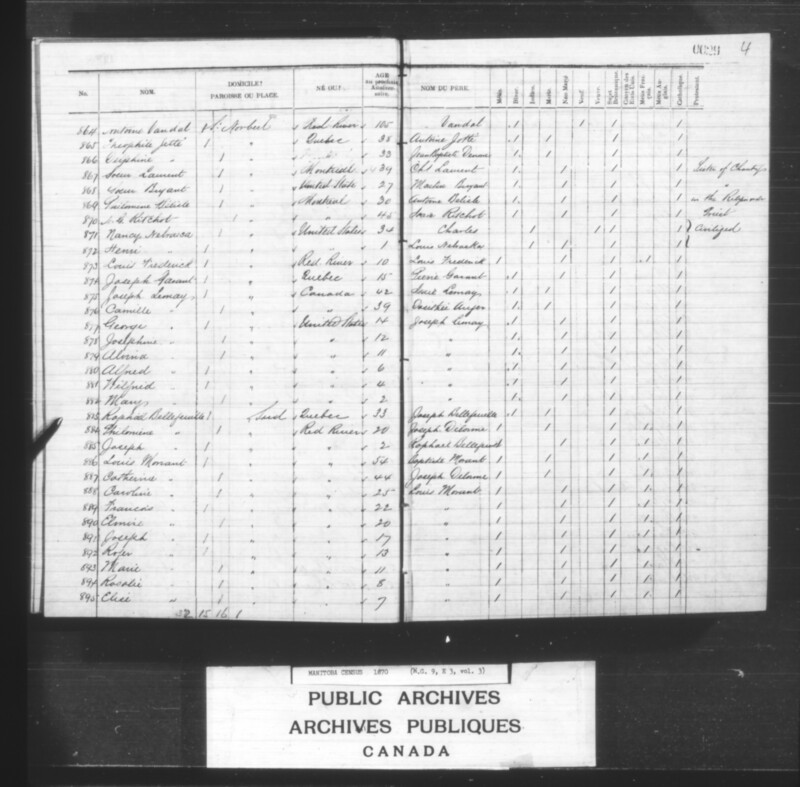 See also genealogy; genealogy; HBCA biographical sheet. – [2015-2017] Maurice 22/ 23, Alphonsine 19, Jerome 14. See also genealogical notes; genealogy; genealogy; and biography. – [2011-2012] Norbert 5, Eliza 3. – [2005-2008] Frederick 9, Rosalie 8, Domithilde 3, Virginnie 1. – [1997-2002] Genevieve 30, Angelique 28, Annie 25, Casimire 24, Andre 23, William 22. – [1990-1995] Joseph 11, Barthelemy 9, Alexandre 6, Marie 4, Alfred 3, Marjilde 1. – [1986-1987] Helene 3, Alexandre 1. – [1980-1983] Patrice 8, Mathias 4, Marie 3, Virginie 1. – [1959-1966] Baptiste 19, Modeste 17, Rosalie 15, Roger 12, Pierre 9, William 7, Virginie 4, Mathilde 1. – [1969-1977] Daniel 38, Antoine 20, Colombe 18, Sarah 16, Napoleon 14, Celina 12, Louis 10, Melanie 8, Adelaide 2. – [1888-1889] Virginie 6, Moise 2. 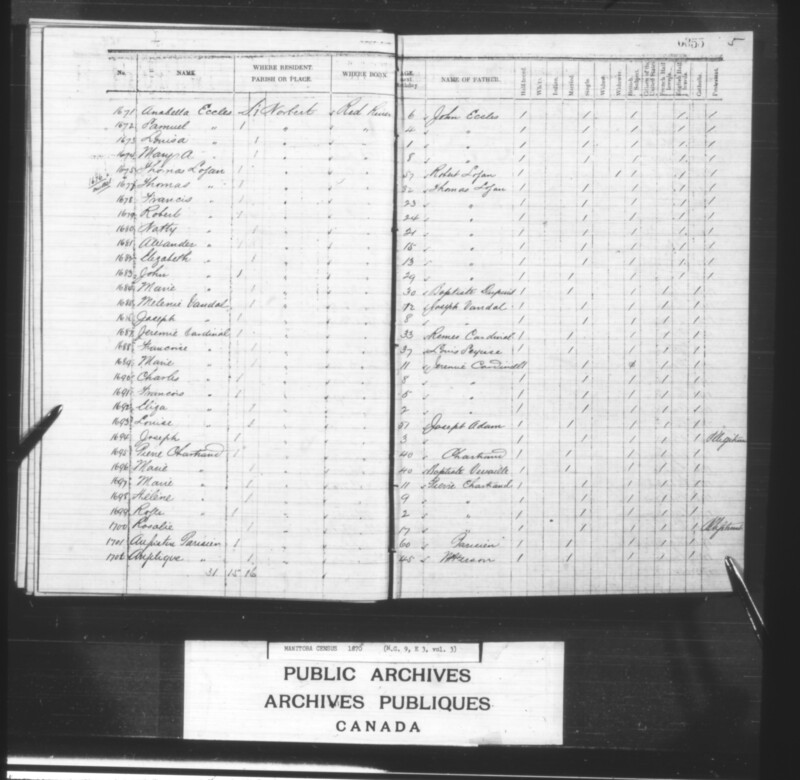 – [1947-1955] Rosalie 24, Thomas 22, Francois 20, Elise 18, Marguerite 16, Melanie 14, Nancy 12, Harry 10, Julien 7,  Alexandre 6. – [1942-1944] Julien 5, Marie 3, Alfred 1. – [1935-1939] Catherine 43, Louise 24, Roger 21, Melanie 18, Moise 15. 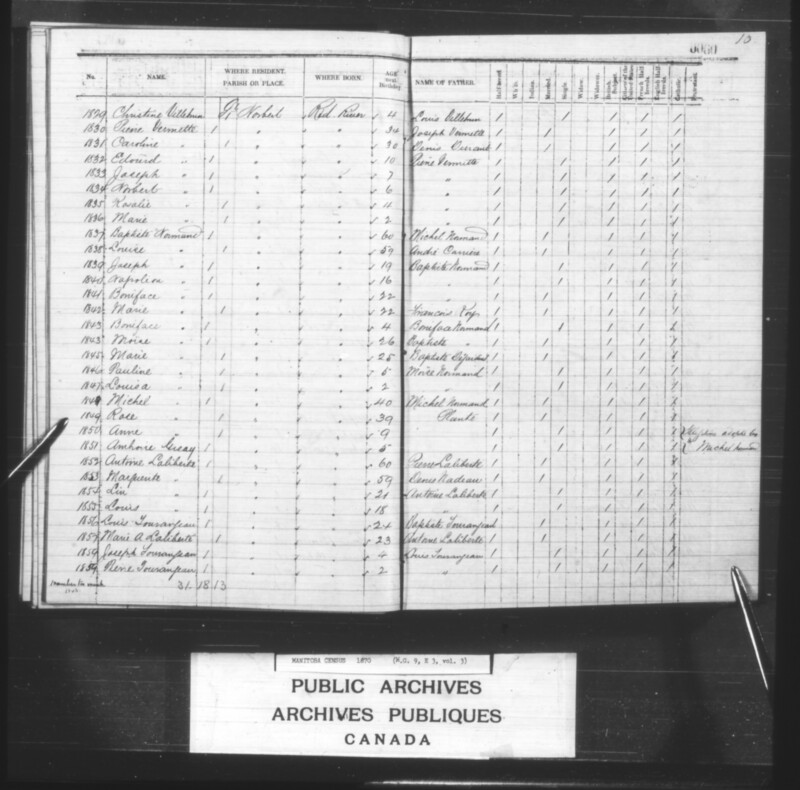 – [1915-1919] Marie 18, Pierre 17, Marguerite 16, Baptiste 13, Adolphis 11. – [1924-1930] Augustin 17, Napoleon 15, Simon 13, Alexandre 11, Virginie 7, Alfred 5, Ida 3. – [1898-1901] Helene 9, Clara 5, Philomene 3, Maxime 1. – [1862-1864] Pierre 4, Marie 3, Therese 1. – [1859-1860] Joseph 4, Pierre 2. – [1867-1868] Toussaint 6, Marie 3. – [1854-1855] Lin 21, Louis 18. – [1846-1847] Pauline 5, Louisa 2. – [1872-1875] Therese 20, Celina 17, Marguerite 15, Roger 11. – [1892-1895] Maxime 25, Toussaint 23, Augustin 22, Francois 20. 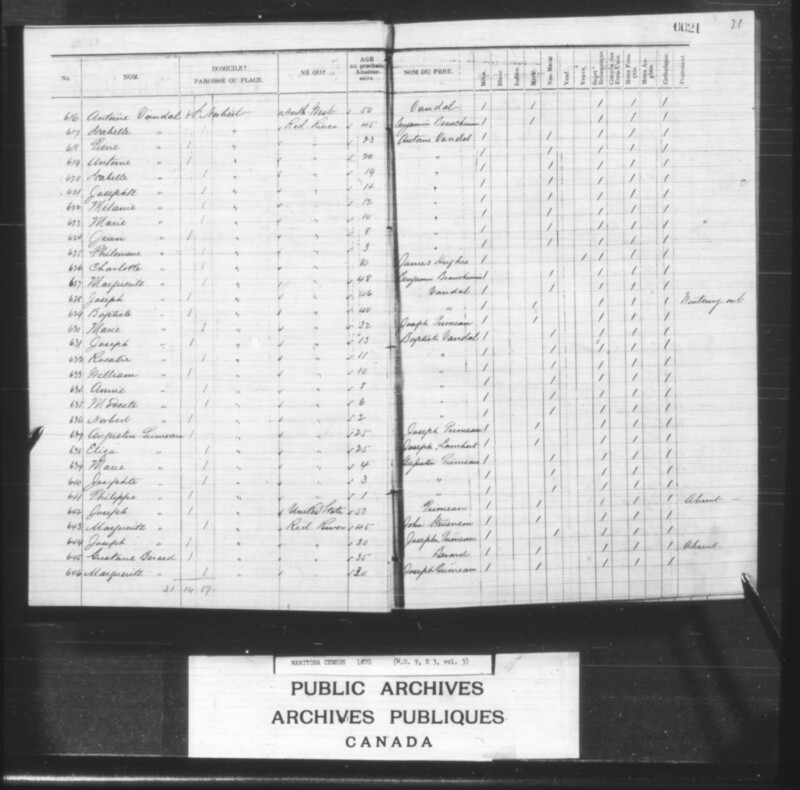 – [1878-1885] Marguerite 17, Frederick 15, Pierre 12, Baptiste 10, Isabelle 8, Joseph 7, Joseph 6, Francois 3. – [1839-1840] Joseph 19, Napoleon 16. 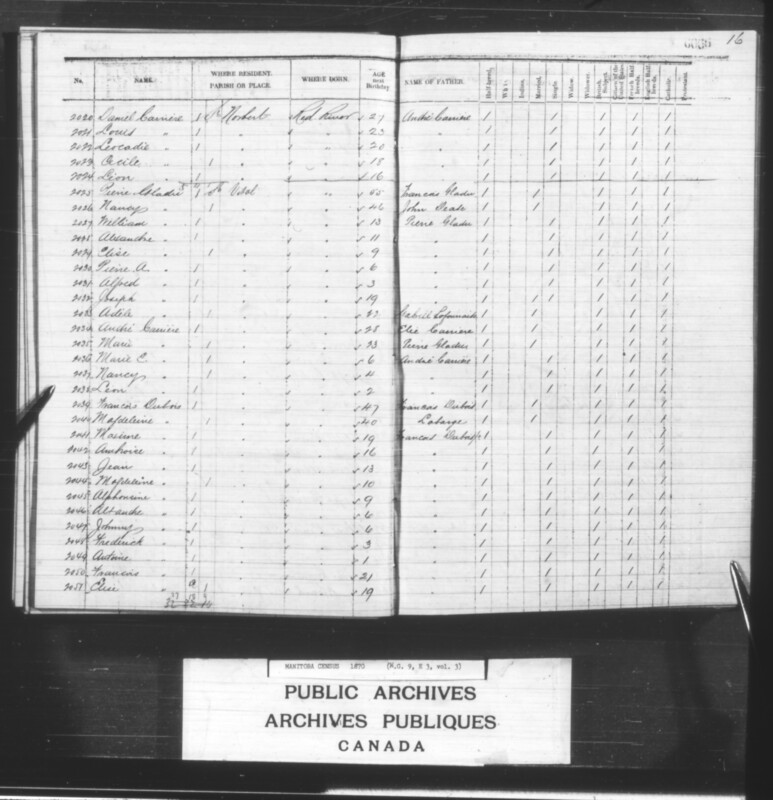 – [1832-1836] Edouard 10, Joseph 7, Norbert 6, Rosalie 4, Marie 2. – [1826-1828] Louis 15, Pierre 14, Marie 12,  Christine 4. – [1819-1824] John 12, William 10, Jean 9, Angelique 5, Alexandre 4, LaRose 2. – [1803-18079] Joseph 23, Charles 20, Angelique 19, Marie 15, William 8, Celina 6, Thestust?/ Thestrist? 3. – [1795-1797] Jean 14, Joseph 11, Vincent 7, [1797-1799] Baptiste 6, Clement 4, Jacque 2. – [1812-1816] Baptiste 11, Angele 9, Bernard 6, Abraham 4, [?] 2. – [1788-1789] Elise 21, Joseph 18, Henri 15. 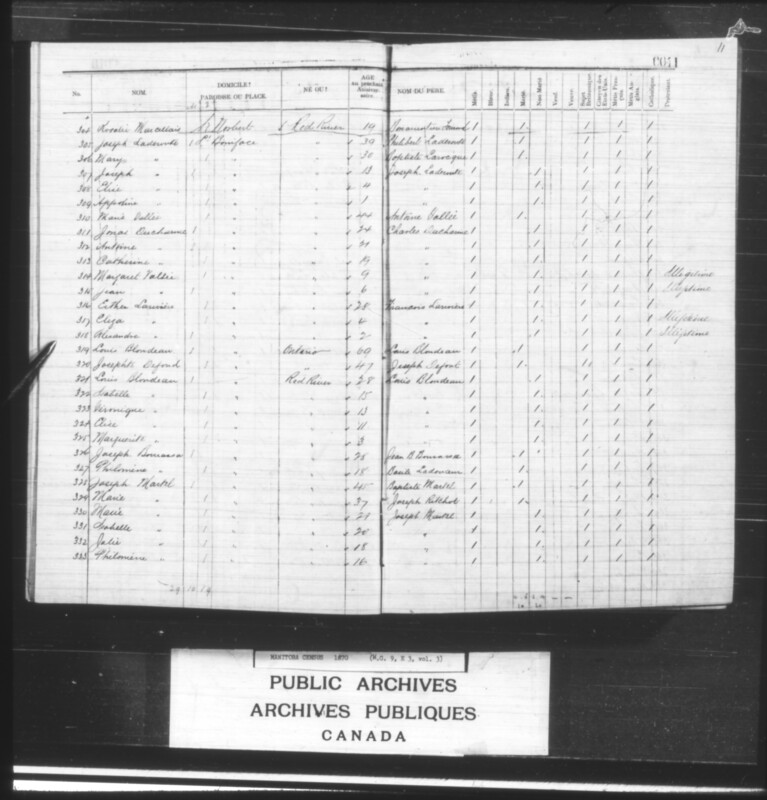 – [1781-1785] Marie 9, Joseph 7, Rosalie 4, Elise 3, Clemence 1. – [1776-1778] Clara 3, Julie 1. – [1766-1773] Marie 24, Narcisse 22, Elise 20, Theophile 16, Caroline 14, Joseph 12, Augustin 10, Louise 7. 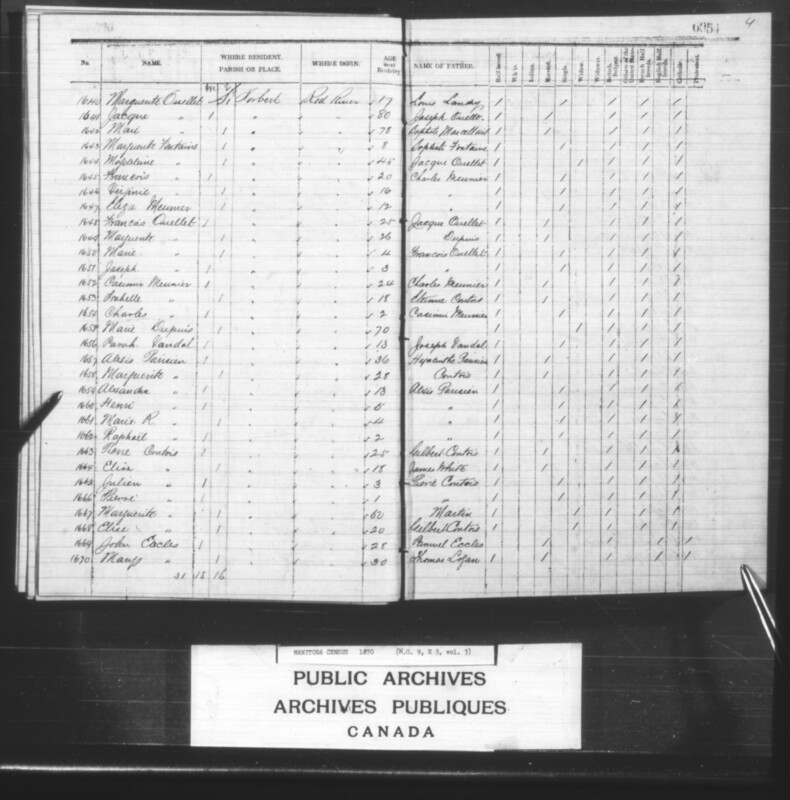 – [1758-1763] Catherine 13, Paschal 11, Marie 9, Adele 8, Adolphise 5, Caroline 1. – [1753-1754] Angelique 5, William 2. – [1739-1746] Sarah 22, John 19, Xavier 17, Moise 15, Joseph 13, Charles 11, Rosalie 9, Maria A. 4. 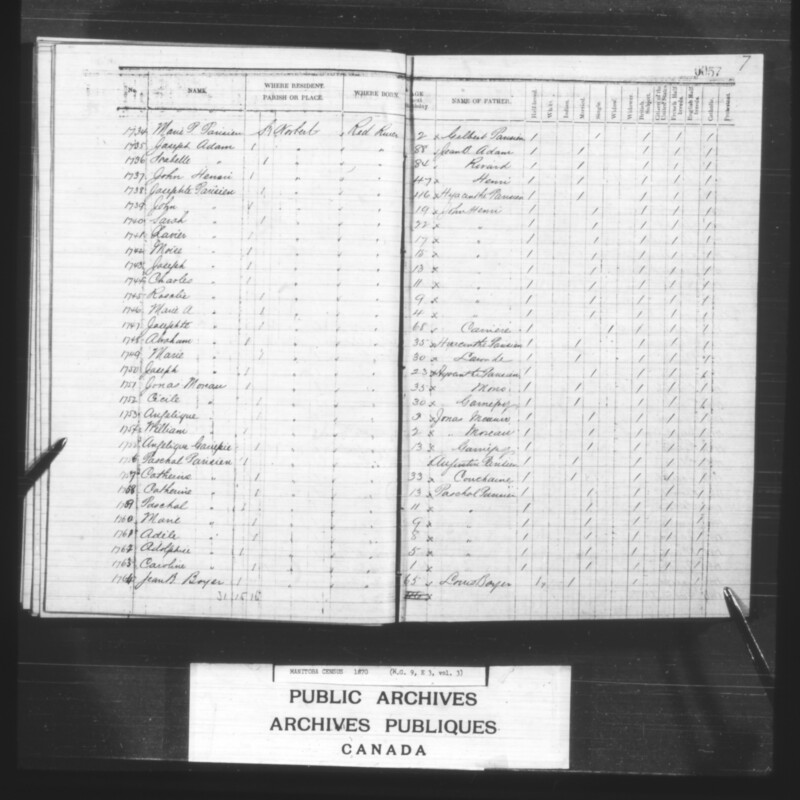 – [1732-1733] Severe 8, Annie 5,  Marie P. 2. – [967-969] Jean 7, Marie 5, Patrice 2. 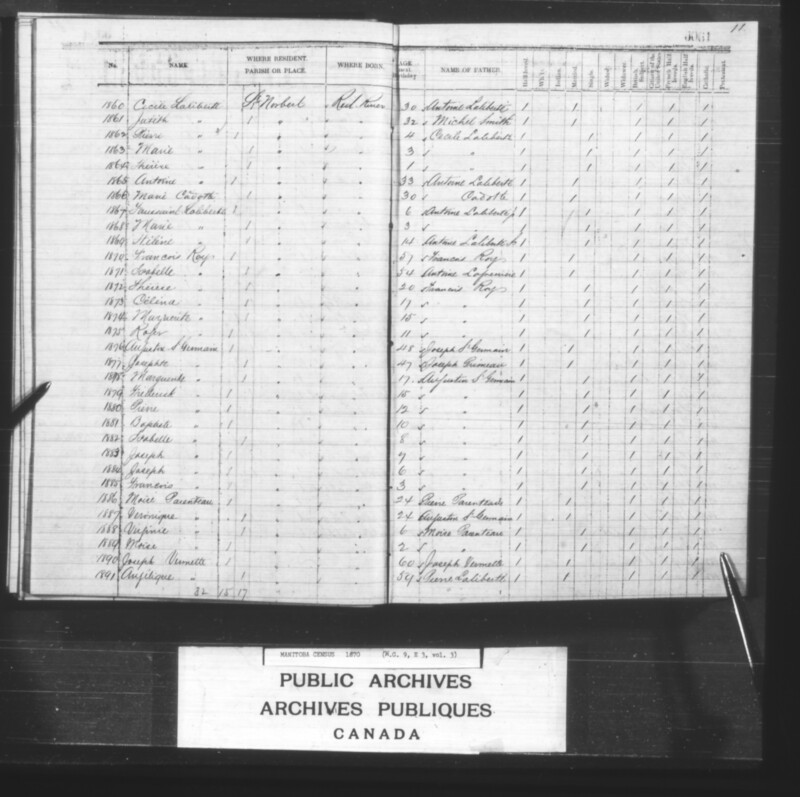 – [1717-1721] Pierre 10, William 8, Henri 5, Julien 3, Pauline 1. 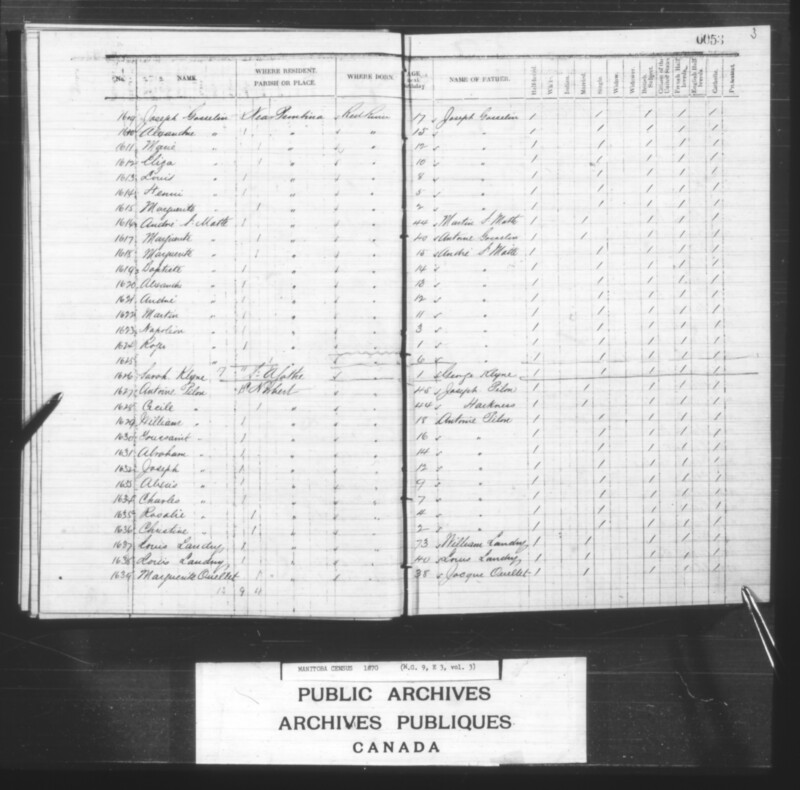 [1701-1702] Augustin Parisien (Métis, born 1810 to #3829 Parisien) married in 1858 Angelique Adam dit McPherson (born 1820/ 1825), and Louise ‘Trois-pouces’ Vivier dit Allard (born 1819, died 1847), and Therese Ducharme (born 1812, died 1834). – [1702-1714] Cecile 21, Caroline 18, Solomon 17, Clemence 14, Joseph 13, Rosalie 13, Elzear 11, Adelaide 11, Athanase 9, Edouard 8, Marie 7, Esther 5, Elise 4. – [1697-1700] Rosalie 17, Marie 11, Helene 9, Roger 2. – [1689-1692] Marie 9/ 11, Charles 8, Francois 5, Eliza 2. – [1677-1682] Thomas 32, Robert 24, Francis 23, Natty 21, Alexander 15, Elizabeth 13. – [1671-1674] Mary A. 8, Annabella 6, Samuel 4, Louisa 1. – [1665-1666] Julien 3, Pierre 1. – [1659-1662] Alexandre 13, Henri 5, Marie R. 4, Raphael 2. – [1724-1729] Roger 13, Marguerite 11, Sophie 8, Marie R. 7, William 4, Angelique 1. – [1251-1255] Alfred 10, Napoleon 8, William 5, Justine 3, Louisa 1. – [1650-1651] Marie 4, Joseph 3. – [1645-1647] Francois 20, Virginie 16, Eliza 12. – [1629-1628] William 18, Toussaint 16, Abraham 14, Joseph 12, Alexis 9, Charles 7, Rosalie 4, Christine 2. –  Alexandre 20, [1267-1269] Joseph 13, Boniface 10, Oliver 5. – [1258-1264] Genevieve 20, Roger 14, Julien 9, Napoleon 8, Marie 6, Joseph 4, Justine 1.